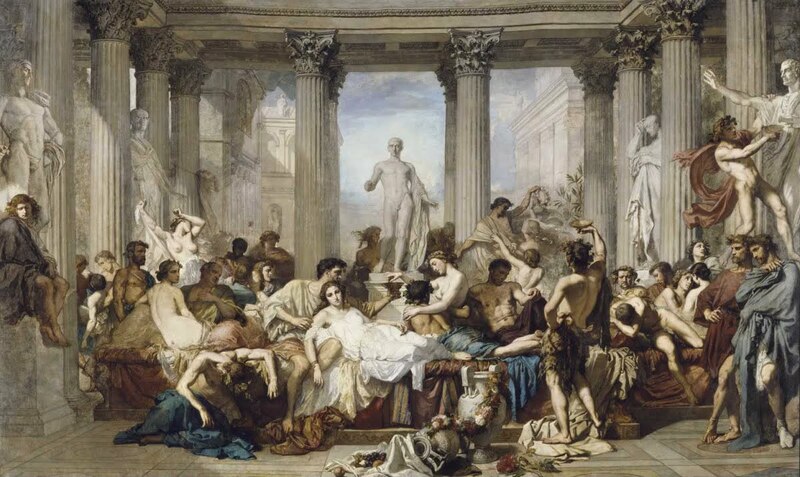 The idea behind a Toga Party is obvious: to elevate the conventional student pursuit of drinking to excess by associating it with the well-established image of Roman decadence. Vomiting down one’s front is legitimised by classical precedent! To paraphrase Marx’s 18th Brumaire, the participants find in ancient history the self-deceptions necessary to conceal from themselves the humdrum nature of their activities. In a similar manner, the spate of Roman analogies for the rise of Trump serves to present our current historical predicament in more elevated terms as the crisis of the Republic and the potential triumph of decadent autocracy, as historical events in the grand old manner, rather than any of that tedious or depressingly complex analytical stuff. We are living in time of Great Men and Terrible Villainy and Heroic Deeds and Grand Gestures! The fact that this all derives from a thoroughly old-fashioned and dubious conception of history, just as the toga party is based on multiple layers of literary representation and reception, is beside the point, except for pedants like me. No, the Romans didn’t spend their entire time eating honeyed dormice, shagging their sisters and changing the course of World History with their speeches or battles – but ‘The Romans’ did, and that’s what matters. A man stands before a crowd, trawling for votes. He’s rich and the son of a rich man, though his personal finances are tangled, he’s saddled with debt, and his career to date has been studded with scandal. Far from pretending to be good, he makes a virtue out of his lack of pretense, and plays up his excesses as extravagantly as he stokes the crowd’s resentment of his own class. Call him Donald Trump. But this man is also Julius Caesar, Catiline, Clodius, and a legion of other men who lived in ancient Rome, from which the American Founders drew inspiration for the political system we have today. As you’d expect from both these authors, the articles are substantially better informed and more interesting than the average – but they suffer from the same limited, misleading historical perspective. Connolly focuses on the rhetorical techniques of ‘populist’ politicians, the ways in which they denounced their enemies and played on the resentments of the masses – in a manner intended to heighten resemblances to Trump, but also with a slightly odd recurring emphasis on the reception of the Roman Republic by the Founders of the United States, as if this automatically makes those resemblances more plausible or significant. Insofar as the wider context for these speeches is considered, it’s presented in terms of a growing divide between the elite and the mass of the population; not implausible, but scarcely the whole picture, and again clearly intended to resonate with the now-conventional account of our own situation. Everything is then understood in terms of the ability of unscrupulous demagogues to take advantage of popular discontent – which tends to imply that historical developments are indeed shaped by the actions of a few larger-than-life individuals. There’s little reference to the institutions and structures of Roman politics, beyond the suggestion that they’d already failed; the idea that leading Romans were prisoners of circumstances, driven towards populism for the sake of self-preservation as much as they cynically sought to take advantage of it, doesn’t feature, because of course that’s one key respect in which the American situation is radically different. The USA needs to be the new Rome, so that ‘we’, the new Roman elite, can learn the lesson of the past that things can’t go on as they are. Rome’s political class never succeeded in refreshing their own habits of speech and thought. They failed to probe and heal the alienation that had fragmented the republican community. Like today’s self-absorbed elites, they had become addicted to their wealth and to traditional authority, and never imagined their influence could disappear. Kaminska avoids such overtly didactic statements; the message seems rather to be ‘nothing new under the sun’, as Octavian’s production of ‘fake news’ (accounts of Antony’s debauchery and sexual excesses – which come from Cicero’s Philippics rather than Octavian propaganda, but never mind – and rumours that he was under Cleopatra’s thumb and planning to move the empire to the east) allowed him to ‘hack the republican system’. There seems to be a certain amount of inconsistency in the account, not least the citation of Syme’s caution – “of the facts there is and was no authentic record”- followed by confident statements about how the Roman people viewed the whole thing. The application of the idea of ‘fake news’ to the deliberate production of anti-Antony material, i.e. conventional political propaganda, seems to miss the point of the concept (and the suggestion that it is at least partly new, and closely connected to the rise of social media) completely; presumably that’s the aim, but it really needs to be argued more explicitly. Again, events are presented in terms of the actions and decisions of a single individual, Octavian, to win the struggle and then establish his power. There certainly are interesting things to be said about the war of images and value-signalling between Octavian and Antony – and important work has been done on the basis of implicit comparisons with twentieth-century authoritarianism (not just Syme but also Zanker – but see Wallace-Hadrill’s criticisms of some of the underlying assumptions). However, these have to be informed by a clear sense of the radically different technological context: the slowness, and very partial reach, of any form of communication in a pre-modern society. Suggesting that the slogans (more often images, of course) on coins are like archaic tweets is cute – but it’s the differences between the Roman monetary system and Twitter, above all in terms of people’s use of them and their reception of the message, that seem more interesting, and certainly demand more careful analysis than a throwaway remark. Again, there seems to be an implicit argument about precedent here; no, Twitter isn’t actually new or interesting, this sort of thing goes back to the Romans, more or less. People being people (Thucydides’ ‘human thing’), you can always find resemblances between past and present if you look hard enough; sometimes – and this can be discerned in Connolly’s article, though I’m not sure whether this was intended – the tradition of identifying such resemblances is so well established that we are conditioned to find them and treat them as emergent properties of the historical facts, rather than our own imaginative projections. Marx’s point about the French revolutionaries draping themselves in the costumes of ancient Rome was that this was a self-deception as much as a deception – and that this belief in continuities and analogies then had consequences for actions and decisions. People make their own history, but they do not make it just as they please… It’s unavoidable – but at least we can try to imitate Nietzsche’s historical men, in choosing our myths and analogies carefully, conscious of how this choice will shape our perception of the world. Dressing up Trump et al in togas may be helpful – but if its purpose is simply to depict our present situation in the bright colours and exaggerated gestures of imaginative fantasy, whether of heroic great men or appalling decadence, then this is probably not what we need right now.